METALLICA celebrated the launch of its beer brand, Enter Night, on January 14 at an invite-only party in West Hollywood, California. 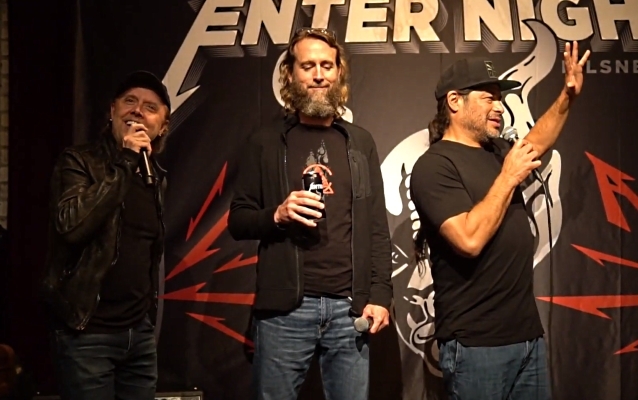 Drummer Lars Ulrich and bassist Robert Trujillo took to the stage at the event to discuss their collaboration with Stone Brewing on what has been described as "a hoppy pilsner played through a distortion pedal." The beer first appeared on the band's fall 2018 tour dates and will gain full U.S. distribution in the first quarter of 2019. A spring rollout will include Europe, Australia, China and elsewhere. 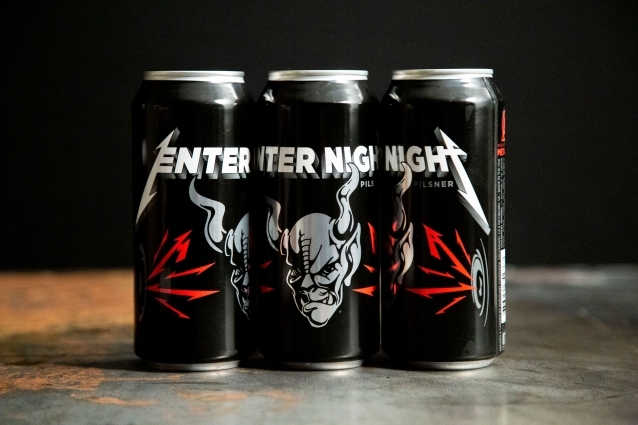 Enter Night Pilsner is the outcome of a genuine creative spark between two entities that grew to become international forces of nature in their respective worlds, yet came from the fringes. An intensity of vision combined with a shared middle finger to the status quo makes Enter Night Pilsner a chorus of collaboration worth celebrating. The members of METALLICA and the leadership of Stone participated at every step alongside their talented brewing team. From METALLICA's Bay Area HQ and the brewery HQ in San Diego, to many beers backstage at shows, the spirit of collaboration was powerful. Ulrich and Stone co-founder Greg Koch even enjoyed multiple occasions at Lars's home "discussing" (industry speak for "drinking") beers. After all, there was only one chance to get this right, and anything less than an incredible result was not an option. METALLICA previously ventured into the booze market with its whiskey, "Blackened", which which was made available in 2018 through the band's own Sweet Amber Distilling Co.